The second floor consists of the West and the East wings are connected by a corridor. At the center of the second floor there is a narrow wooden staircase leading to the central tower Gedung Sate. Central tower is further divided into two rooms; The first is the exhibition space photographs in West Java development, and the second is bounded by Terrace Coffee glass wall on the terrace, visitors can enjoy a panoramic view of the quite beautiful, especially around the area of ​​green building sate by trees. To the north can be seen clearly Monument struggle with panoramic mountain Tangkuban Perahu as background. architecture, has an interesting history in the national scale. After the Dutch government plans to move the capital of the archipelago of Batavia (Jakarta) to Bandung in the year 1017, they hire a young architect engineering graduates Delft University, State Belanda ( Holland ), named J.Gerber to design the central government building (Gouvernemens Bedrijen) or the new GB. As a selected location of an area northeast of Bandung area of ​​27 acres, that time was concentrated to the area of ​​governance and government employees housing for 1500. 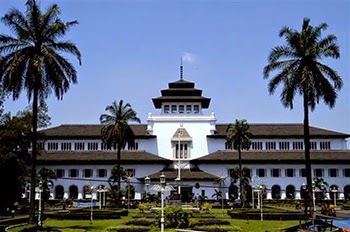 Gedung Sate as one of the most beautiful buildings in Indonesia inaugurated in 1952, could be described as the Freedom Palace building even as the central government of West Java Province. Gedung Sate Synonymous with architectural ornament in the form of a skewer on its central tower, has long been a quirk of Bandung which is not only known to the public in West Java, but also throughout Indonesia. Sate building consists of four floors. On the first floor there is a reception hall, which leads directly to the open space where there is a bronze statue of rhinoceros. This place is also often used as a Sundanese musical performances when visits or official ceremonies took place.